Hanif Khalil, M., Ramzan, M., Ur Rahman, M., Aamir Khan, M. (2012). Development and Evaluation of a Solar Thermal Collector Designed for Drying Grain. Iranian Journal of Energy and Environment; previously called: Iranica Journal of Energy & Environment, 3(4), -. M. Hanif Khalil; M. Ramzan; M. Ur Rahman; M. Aamir Khan. "Development and Evaluation of a Solar Thermal Collector Designed for Drying Grain". Iranian Journal of Energy and Environment; previously called: Iranica Journal of Energy & Environment, 3, 4, 2012, -. Hanif Khalil, M., Ramzan, M., Ur Rahman, M., Aamir Khan, M. (2012). 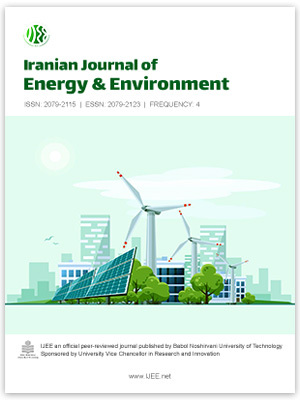 'Development and Evaluation of a Solar Thermal Collector Designed for Drying Grain', Iranian Journal of Energy and Environment; previously called: Iranica Journal of Energy & Environment, 3(4), pp. -. Hanif Khalil, M., Ramzan, M., Ur Rahman, M., Aamir Khan, M. Development and Evaluation of a Solar Thermal Collector Designed for Drying Grain. Iranian Journal of Energy and Environment; previously called: Iranica Journal of Energy & Environment, 2012; 3(4): -.